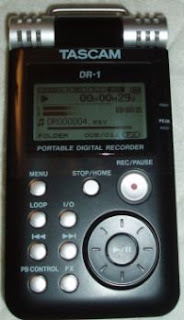 My friend and colleague Eugene Sonn recently purchased a Tascam DR-1 handheld digital audio recorder. He wanted to put it through the paces before deciding whether this low-cost recorder was a keeper. I got my DR1 late on Thursday. I have taken it for a spin and have decided to return it. While it’s a solid recorder that would be very good as a back-up, I would not want to count on it as a primary recorder for radio production. To hear in headphones while recording must turn “Monitor” option on. Not a big deal, other than when you are not in record (such as playing back last track) you still hear what is coming through the mic on top of what you are playing back. Some would say the non standard battery is a con. I don’t think so. It seems to last a long while and you can buy a spare for as little as $25. I would however suggest you would want to buy the optional AC adapter since it can charge the battery much faster than an USB cable can. Overall this unit seems a lot like the Marantz 660 was when it first came out. It didn’t go very well with low-level dynamic mics such as EV RE50 and needs some more oomf. But I think that could be fixed in 2nd generations. This is much smaller than the 660 and unlike recorders that have buttons for level controls, this one has a wheel that doesn’t make a sound when you adjust it. First a recording with the internal mics. Then using the RE50 thorugh Mic 1 input (mini input). Then another through the mini input, but this time with the menu setting with the gain on “high.” The Tascam DR1 has both a wheel on the side to set levels and some menu-driven gain settings to put things in the ballpark. Finally, using Mic 2 input (the 1/4 inch mono input) and the RE 50. In my listening, the Mic 2 input is very clean, but the problem is again that it doesn’t give enough levels from a mic such as RE 50. Maybe if you wanted to use a higher output mic this recorder would be for you. I would definitely recommend this to someone as a back-up. For some people on a budget who want to avoid a mini-input it is good….just choose your mic wisely. This has convince me to buy the Oade Brothers mod of the 660…unfortunately I read it’s on backorder for a few weeks. And finally, for comparison’s sake I did a little post-processing and maxed out the levels on each recording. As you can hear, while setting the 1/8th inch jack to “mid” appeared to decrease the background hiss a bit, when you pump up the volume it sounds just as noisy as when you use the “high” setting. Overall, the recorder sounds respectable when using the 1/4th inch input, but the 1/8th inch input is borderline unusable. The internal mics sound decent, but are extremely susceptible to wind and handling noise. If you’re looking for a handheld recorder with decent internal microphones, I think you might be better off with the Zoom H2. But the Tascam DR-1 sounds significantly better than the Zoom H2 or H4 when using an external mic — as long as you’re plugging that mic into the 1/4th inch input. The only real downside is that it’s hard to get a decent recording volume with a dynamic microphone. Still, for a $200-$300 recorder, the DR-1 seems respectable, if not exactly in the same league as the Marantz PMD660 or Sony PCM-D50. I’m not sure here, but are you referring to the Marantz PMD 620 when you mention the PMD 660? Nope. The Marantz PMD620 is a handheld recorder with 1/8th inch inputs. the PMD660 is a more expensive unit with 2 XLR inputs. I know them both, but I jumped to conclusions because the 620 is more in the league of the DR-1 than the 660 (size and feature wise). I do like the XLR’s on the 660 though. I never got why they can’t fit a couple (or even one) XLR – TRS combo’s on the compact recorders. Yeah I know, space. There’s no power on the 1/4″ jack because it’s a stereo jack. If there was power it would have to be mono, right? I haven’t had any problems with using internal or external mics on mine, I thin it sounds incredible. It does really well with loud sources like concerts, especially with the analog peak limiter turned on. I’ve used the Zoom but much prefer this recorder. Hmm.. I know I’m late in this several-month-old chain, but I have to point out anyway that you have to have an impedence-matched xlr to 1/4 adapter, otherwise you lose out since you can’t just run an xlr signal into a 1/4 jack because of different impedences. The sales rep at some store told me that when I purchased it. It’s true. The adapters have a little transformer in them to drive the input impedence into the output. I’ve owned this recorder for almost a year now. Totally impressed with its warm sound and loss hiss. I record loud concerts and use the LINE-IN. The Pre/ADC is this puppy is top notch. I ditched the original Edirol R09 because I thought the DR-1 sounded much, much better. The biggest test was recording direct from a Soundboard and it handled it great! No crackling in the SBD recording at all. Only con: Needs an auto increment recording feature for when a file hits 2GB limit. I’ve been using this recorder for some months, now, and I love how clean and cleaar it is when using the internal mics for capturing soundscapes and university lecturers. Yesterday I used it with the CMC-8 mini-mics sold by Sound Professionals (based on the ES943 capsules) and an external 9V battery module, and I was really surprised to see how clean it sounded, and how well it could manage dynamics of sounds as different as solo instruments (piano, sax, cello…), a chamber orchestra and a powerful wind orchestra. No distorsion at all, no hiss, and a perfect handling of dynamics. And the resulting sound was also warm and “very musical”. As for the 2GB limit: OS 2.0 solves this problem, as well as introducinng some nice features. I've owned this recorder for almost a year now. Totally impressed with its warm sound and loss hiss. I record loud concerts and use the LINE-IN. The Pre/ADC is this puppy is top notch. I ditched the original Edirol R09 because I thought the DR-1 sounded much, much better. The biggest test was recording direct from a Soundboard and it handled it great! No crackling in the SBD recording at all.